One of the more dramatic native plants we will encounter as we walk through the woods, is the Vanilla Leaf (Achlys triphlla) Sometimes known as the Deer foot (as its leaves resemble the hoof print of the deer) this perennial pushes its way through the earth in March and heralds the coming of spring with its vivid green leaves.The plant will be found in moist shaded woodlands, dappled shade and along stream edges. 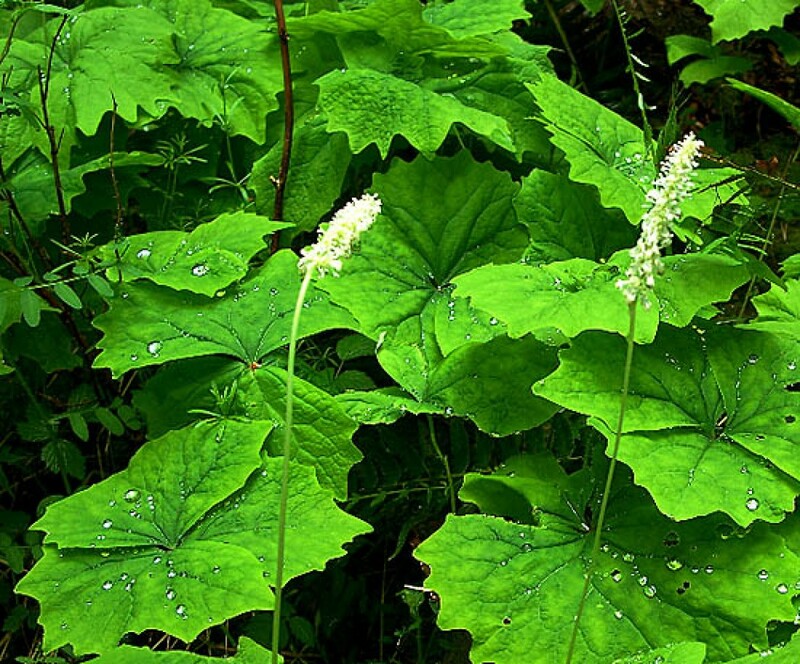 The leaves are large and fan shaped with three asymmetrical, coarsely blunt toothed leaflets. The plant reaches a height of 10 to 30 cm. In April a single stem grows 8 to 20 cm above the leaves where numerous tiny flowers create a creamy white bottle- brush like flower spike about 2 to 5 cm long. What is interesting about the vanilla–leaf flower is it is a hermaphrodite (contains both male and female organs) and pollinization takes place when wind blows through the forest and spreads the pollen. The fruit of the Vanilla–leaf are tiny and crescent shaped and is dark grey to reddish brown, slightly hairy and leathery to the touch.What is so visually stunning about the vanilla–leaf is when the sun filters through and shines on the leaves, they seem to warm up to a vibrant shade of chartreuse green seldom seen in the forest. In many spots the plant forms a continuous green carpet over the forest floor in sharp contrast to the dark green, which surrounds them. The Saanich of Vancouver Island often used the vanilla–leaf as a deterrent for mosquito’s and flies. They would hang bunches of the leaves to dry and place them around doorways. The dried leaves give off a sweet vanilla like scent, which also perfumes the house. Sweet after death is another name some attributed to the vanilla-leaf plant. In the fall and winter unlike other plants whose leaves wither and die, the vanilla-leaf leave behind a reminder of their presence. 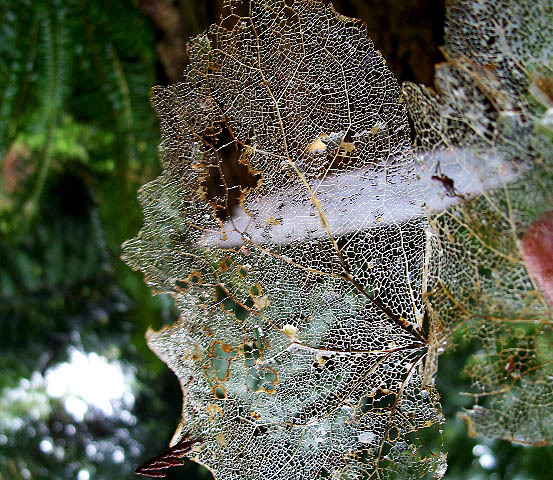 The outline of the leaves although no longer green form a lacy network of veins thus creating another interesting visual on the forest floor. Our native plants are unique and beautiful, before we hurry to rip them out of our yards learn about their qualities and encourage them to be a part of our gardens. Check out the gardens around the Gabriola Museum. There you will find native plants with nametags for identification. Our native plants have a long history and deserve our protection and cultivation.